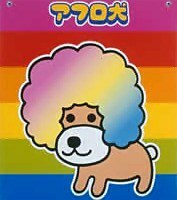 Plot Summary: Afro-Ken, a dog with a rainbow-colored afro, is a happy dog that does not speak. He likes things that look like him, such as cotton candy. There are different types of Afro-Ken, with different hairstyles, such as a mohawk (called Mohican-Ken), curls (Curly-Ken), and no hair (Normal-Ken).